A versatile tool that provides a mid-span mount for a 45 Degree Corner Block when a pole is not nearby. The Set-Up Bracket is secured to the strand with a strand clamp, safety clip, and tightening knob (all included). The strand attachment assembly swivels to ensure proper alignment with cable reel, allowing flexibility in cable reel and Set-Up Bracket positioning. Steel construction. Essentially a Set-Up Bracket with a chute built-in, it creates a path from cable reel to strand. Used in less demanding applications where the reel and strand are aligned, eliminating the need for a Set-Up Bracket and 45 Degree Corner Block. The Condux Cable Chute, is secured to thestrand with a strand clamp, safety clip, and tightening knob (all included). 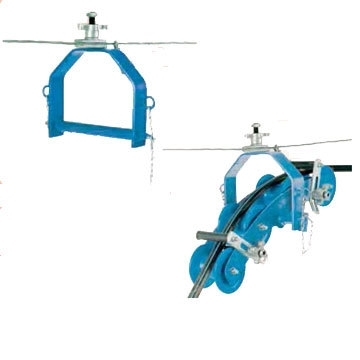 The strand attachment assembly swivels to ensure proper alignment with cable reel. Chute surface is a friction-reducing highimpact synthetic. Accommodates cable up to 3.5" OD.